Powers/Abilities: Niteside can fly and project destructive bolts of darkness. She also regenerated from virtually any injury almost instantaneously. By 2028 she was exceptionally powerful, able to grow to gigantic size and strong enough to throw skyscrapers around like they were toys. After Lord Baeli enhanced her powers even further, she grew to dwarf the solar system, and easily destroyed not only the Earth, but the sun itself. Rock and Forge were devastated by this, but Niteside seemed unbothered...which worried her lover. 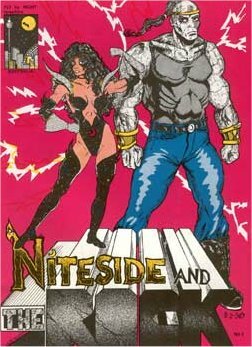 The first two of those heroes both retired and dropped out of sight of the public, but Niteside continued to operate openly, with her power growing constantly. For nearly twenty five more years Niteside grew increasingly powerful and increasingly inhuman and callous, as she began to use more and more drugs. Finally in 2028 she went on a public rampage while on an acid trip, slaughtering the few remaining superheroes and anyone else who crossed her path. Forge came out of retirement to face her, and tried to convince Rock to do the same. While Rock travelled to the past to try and kill Niteside when she was less powerful, his former lover made a pact with the true source of their powers, Lord Baeli, lord of Hell. He increased her abilities one hundred fold, in return for which she promised to initiate Armageddon, and end the world. Lilith witnessed this, and objected, afraid that her own people, the vampyr, would not survive. Lord Baeli ignored her concerns. Niteside returned to Earth from Hell, and slaughtered London, Melbourne, Moscow and New York, before returning to Sydney, where she killed her former ally Forge. 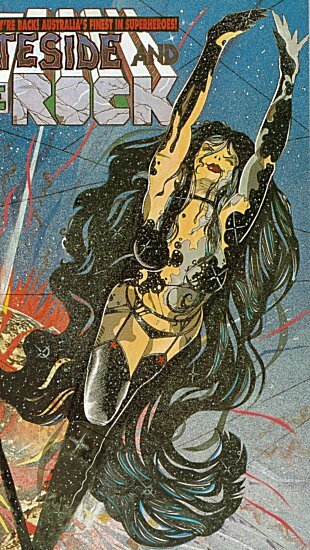 The Rock returned from his sojourn into the past, his own powers enhanced by Lilith to counter the strengthened Niteside. He arrived to find himself dwarfing his homeworld, standing in space looking down on the Earth. Niteside, equally large, confronted him. Unable to do real harm to one another, the Rock was forced to watch as Niteside destroyed the Earth, then sent the sun itself supernova. This explosion, enhanced by Niteside's powers, rippled out into the universe, causing a chain reaction which destroyed everything it touched. Billions of years later new planets had formed and new life had evolved. On the remains of what had once been the Moon, which had miraculously survived much of the destruction long past, the Rock reformed, aware suddenly of the return of Niteside. Both now effectively cosmic forces, the bored Niteside tried to lure the Rock to become heroes or aliens or gods on a new world, covered in insectoid lifeforms. He declined, and as he returned to the ground from which he had arisen, she flew off to amuse herself in this new galaxy.